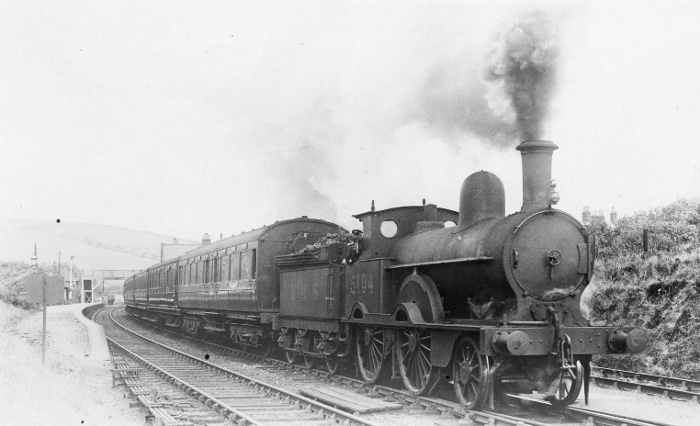 This picture shows a ‘Small Jumbo’ or ‘Whitworth’ or ‘Waterloo’ Class 2-4-0 LMS no. 5104 ‘Woodlark’ (LNWR no. 794) with a passenger train leaving a station that seems to be somewhere in the Lake District. At the end of the platform is a level crossing and just beyond it is a siding with a couple of wagons in it. According to Baxter, the engine was renumbered in March 1927 and withdrawn in January 1931. The photo was taken by W.H. Whitworth, obviously on a trip away from his native Manchester and his usual haunt of Crewe. So where is the station and what is the train? The first carriage is an ex-LYR corridor. Undoubtedly a through carriage (from Manchester Vic?). Note the facing points under the engine worked from a cabin behind the photographer. But where are the signals? Hard to tell but I think all the carriages are ex-LYR. Are you sure there is a level crossing (as opposed to a barrow crossing)? The bridge in the background seems too substantial to be a footbridge. This is St Bees Station on the Furness Railway, just south of Whitehaven. The line is single here, hence the loco is on the facing points of the crossover onto the single line (siding straight ahead). The up starting signal is behind the loco. The bridge in the background is the wooden station footbridge and the signal box can be dimly seen to its left. There was no signal box at this end of the station. The train is an up train from Whitehaven (or further north) to Barrow or beyond.